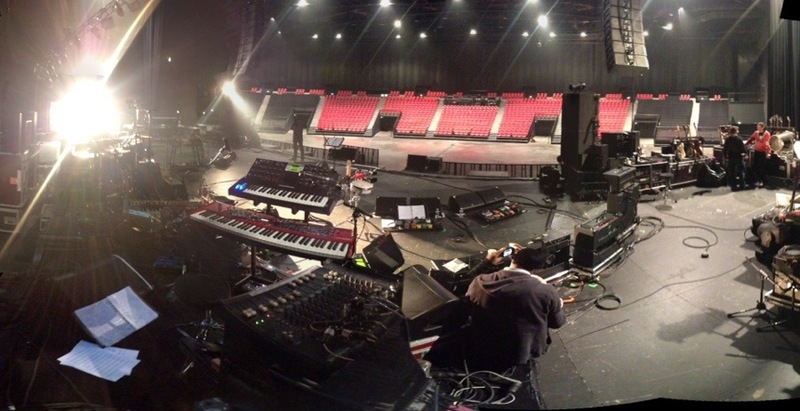 After a long period of preparation, we’re in Amiens for the first show with Damien Saez tonight. I think we have a great concert on our hands, everybody worked very hard doing rehearsals, and now it’s time to try out the set with an audience to make the last adjustments. There will be a lot of additional things added to the show over the next weeks, but this week we’re just going to focus on getting the music and the setlist right. Damien has so many songs that we can’t even play a fraction of them in one evening. A luxury really, I’ve spent the last few years with artists putting out debut albums, where it’s hard to flesh out the songs enough to make a 75 minute set. With Damien it’s the opposite situation, keeping the show down to two and a half hours is a challenge. But if we do three or four shows in a row it’s not reasonable to play for three hours every night, though that might be what we will end up doing.